Free shipping. Buy direct from HP. 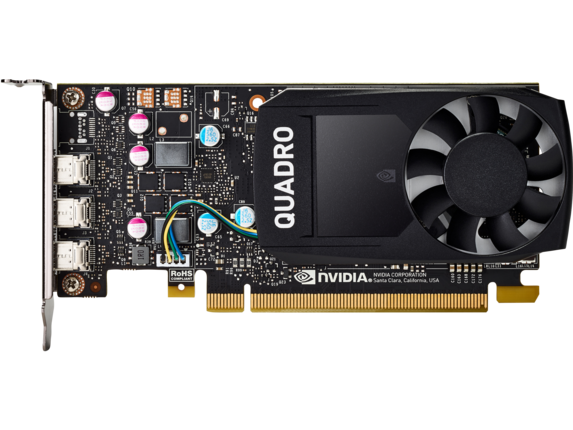 See customer reviews and comparisons for the NVIDIA Quadro® P400 2GB Graphics Card. Upgrades and savings on select products. Enable expansive, extremely high-resolution visual workspaces for your 2D and 3D projects on up to three 4K displays with the NVIDIA® Quadro® P400 graphics card powered by NVIDIA Pascal™ GPU technology. Work with multiple apps and create and manipulate 2D/3D designs and models with complex assemblies, lag-free in real-time, when you access assets stored in 2GB graphics memory. Get high brightness and color saturation, over 10K:1 CR, and support for up to three 4K displays or one 5K display with DisplayPort™ 1.4. Easily manage your setup with NVIDIA® nView®. Create and playback HDR video with H.264 and HEVC engines.